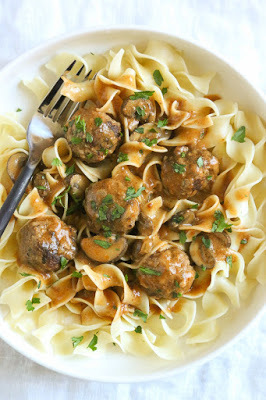 Turkey Meatball Stroganoff looks like a perfect back-to-school dinner with rich flavors and egg noodles that make it comfort food at it’s finest. 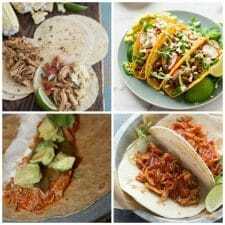 And this recipe can work for the Instant Pot, slow cooker, or on the stove so everyone can choose the method they prefer! I think this Instant Pot, Slow Cooker, or Stovetop Turkey Meatball Stroganoff from Skinnytaste looks like a perfect idea for a school-night dinner. And even though I hate to bring up school, it’s starting today in the district where I used to teach, so today we’re reminding you about this recipe for a kid-friendly dinner that’s easy enough to make on a school night! Pasta is always a winning dinner idea, and you can make this Turkey Meatball Stroganoff in the Instant Pot, in the slow cooker, or on the stove! Serve this delicious meatball Stroganoff with a mushroom and sour cream sauce on egg noodles or rice; this looks like something that will be a hit with the kids! I’m pretty sure most families would love this American classic dish. 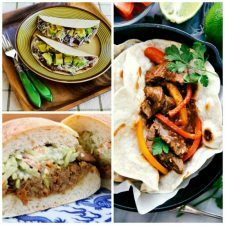 And if your family is one that loves Stroganoff, check out The BEST Instant Pot Stroganoff Recipes for more school-night dinner ideas! Get the complete recipe for Instant Pot, Slow Cooker, or Stovetop Turkey Meatball Stroganoff from Skinnytaste. Check out the slow cooker or pressure cooker recipes with Sausage and Meatballs. Can you use frozen turkey meatballs? I would guess so, but it would be best to click through to the recipe and ask that question on Skinnytaste since it’s her recipe.